Thank you for your interest in the Junior League of Augusta! Complete the Request More Information Form. Our New Member Chair will follow up with you with more information. Prospective members are invited to inquire about Membership year round; however, applications will be accepted beginning in January with final application and payment due no later than August 31 for the year in which you are applying. Attend a prospective member open house information session. Submit the New Member Application sent via email from our New Member Chair. Pay Annual Dues and New Member Course fee of $200. Submit the New Member Program Agreement. We are currently accepting New Members. 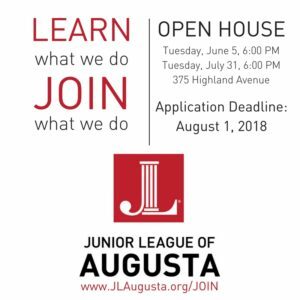 If you are interested in joining the Junior League of Augusta 2018-19 New Member Class, please fill out the Request More Information Form.